When I first learned that Alex B. was coming to L.A. an offline was a must do. It has been several months since Alex and I last saw each other in Seattle for some great Colheita's. So last night was the "Alex comes to L.A. offline at the Casa de Velebil." I picked alex up at his hotel early in the afternoon and gave him the tour of Hollywood. Which I might add is quite the sight to see, especially given that it was Halloween. Alex got to see some pretty strangely dressed people and he got his picture of the Hollywood sign that will score him some points on the home front. A quick stop at K&L wine store to show him what there was, which ended in a Bordeaux purchase for dinner...and darn good thing too, which I'll explain later. We headed back to my place and got ready for the others that were coming. Speaking of the others, here were the players. Dan Macleith, Alex Bridgeman, Jason Sheridan, Alex Rodriquez, Marc Jackson, and yours truly. Due to work and horrible Halloween traffic, we got started a bit later than expected. Have no fear, that and the trick or treaters didn't slow us down. We started with a Vinho Verde and some appetizers. Then moved on to the port tasting, dinner, and then a free-for-all of the Ports. Alex B. and Marc J. 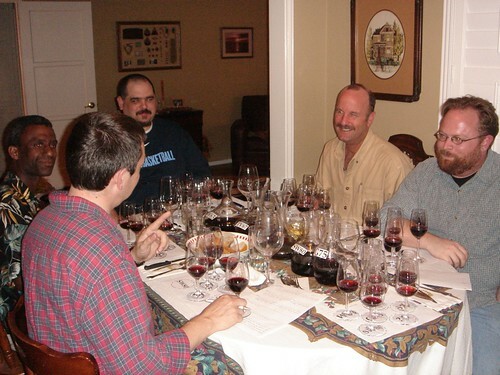 Left to right: Alex B., Mark J., Alex R., Dan M., Jason S.
Decanted 1 hr prior, then retasted 24 hours later. At first it was light ruby red with some soapy bottle stink. This was a little slow out of the gate and I took no further notes until today. The color on this has darkened a lot. Nose is still a soft lavender soap. The palate has lots of spice, lavender, bright red cherries a hint of chocolate, and some strong acidity and noticable tannins. The finish, while not very long, is quite pleasant and is the only thing hurting this at this point. 92 points. However, 24 hours later the color has darkened a lot. The nose has wonderful rose pedals and some dark strawberries. The palate has really put on some weight. That typical spirit is still there, but now there is still some red berry fruit on the palate. The acidity is holding its own with some tannins on the finish. The finish is still not very long, which is its only slight detractor at this point. I must say this is much better than last night. 91-92 points. Lightest color of all with a 7 hour decant. Nose of mature plums. The palate was quite full and dense with a nice dose of spice, a touch of heat, some menthol, and herbs. A nice finish rounded out a solid VP from a year not highly regarded by most. 91-92 points. This was very dark with no signs of fading at all. The nose had some prunes and marrion berries. The palate had a large dose of cigar and cedar with some just matured red berries. A great finish rounded out a remarkable VP. I must say I was amazed at how well this VP is doing at 27 years old. This is a keeper for sure. 92-93 points. This was served blind. After all we gotta through a curve ball in there somewhere right? A solid red center with some slight fading at the edges. A touch of bottle stink at first, which blew off. The palate shows some lively red raspberry fruit. Its meduim bodied and sweet strawberries made this quite the hit at the table. 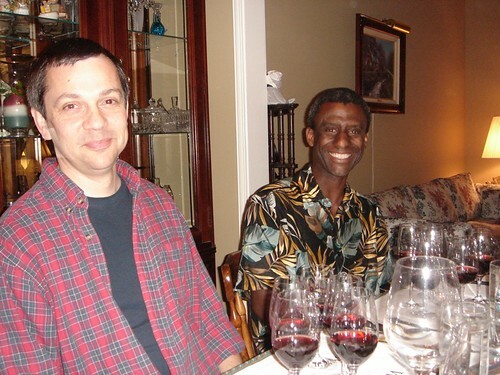 Not to mention the guesses of early 1990's vintage Port or a younger LBV (Jason and Alex R. were getting warm at least). The finish on this was quite long. I must say this really impresses me, and I dare say the rest of the table too. 92 points. We had a couple other bottles of dry red wine with dinner. 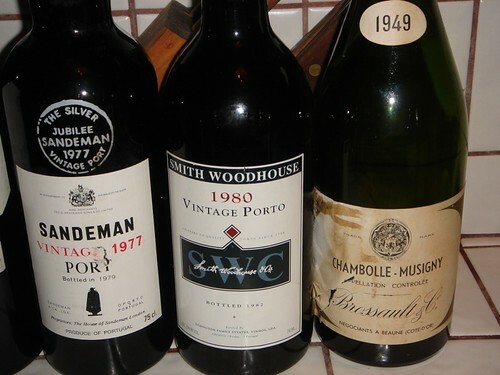 The 1949 Cote d' Oro I opened was a shot in the dark. But luck was not on our side and it was totally oxidized. Then the TCA god struck again on the 2003 Chateau Pont Saint-Martin Pessac-Leognan...total bummer. It was a great evening and I cannot thank everyone enough for bringing some great wines. We talked, laughed, handed out candy, laughed some more, and drank till rather late. A truly great time was had by all. I also must give credit to our own Julian. 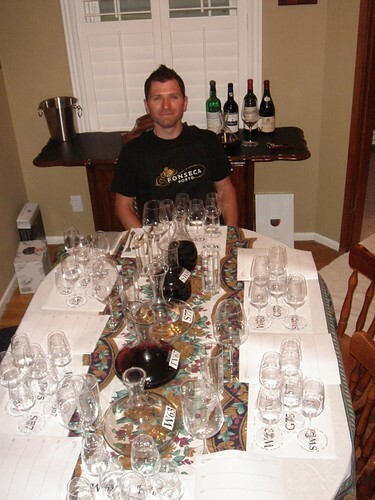 He made up the really cool placemats, tasting sheets, and decanter labels for us. Julian, please chime in with your link so others can use them too. 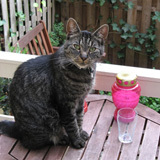 Looks like you created another lovely memory, whilst having a ball at the same time. 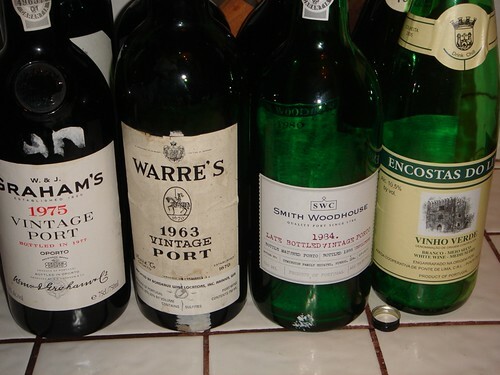 What a shame the Sandeman77 and the Warre63 didn't shine like you would have hoped, but the Grahams75 and SW80 seem to have made up for that. Thanks for the notes Andy, looks like a good evening. Maybe 'shining' isn't the right word. I would have thought that was the one with the highest expectations, and the description wasn't glowing. But yes I would settle for lots of 92pt Ports. Nice notes, and a very nice line-up! 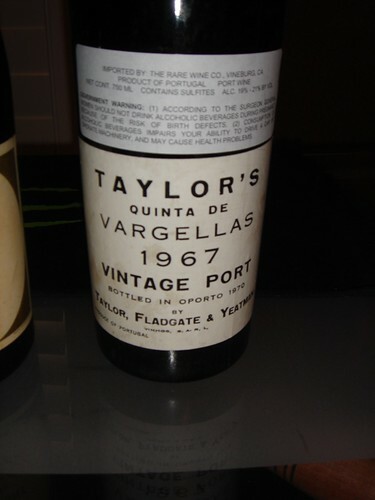 Good to see yet another promising TN on a 1975 port. It was a great time and I can't thank everyone that came enough. Its getting late, but I couldn't resist a small retaste of the `80 Smith Woodhouse VP. WOW, is all I can say. Still mostly primary red fruit with just the begining touches of mature fruit starting to show on the palate and nose. I must say, for a "lesser" house they are spot on in this vintage. Whenever you make it to L.A. let me know. You're always welcome at my place...where a bottle of Port is always open. Andy's being very modest - his cooking was excellent. Steaks prepared and grilled to perfection (even if I did have to educate my American cousins on how to prepare a steak in the "Pittsburgh" style), and a Creme Brulee that was really fabulous. Plus lots of lovely port and claret to wash it down. It was a bit like being in the Old Country. I've just picked up a bit of a stash of Varg '67 - I'll note that it may be a long haul merchant when it comes to decanting times..
Nice notes, and nice to put a face to some names..
Yours, - knackered after organising nineteen firework displays today...!